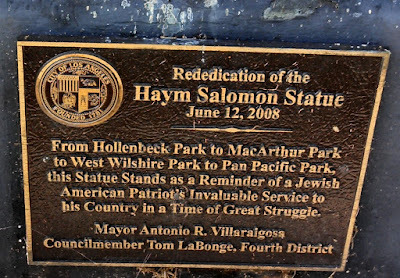 This is the first part of a post by Boyle Heights Historical Society Advisory Board member Rudy Martinez on a little-known statue for a largely-forgotten figure from the American Revolution, Haym Salomon. Enjoy and check back soon for the next installment! In June 2008, a small rededication ceremony was held for a newly-installed, twelve-foot tall statue at the southeast corner of Pan Pacific Park in West Los Angeles. The name of the subject, who had a pivotal role to play in the American Revolution, is rendered with a simple etching at the center of the concrete platform: Haym Salomon 1740 – 1785 American Patriot. The new plaque added with the figure hints the statue might have traveled a somewhat circuitous route before arriving at its present location, but no timeline is given. However, a second smaller engraving at the work’s base reveals that the statue’s beginnings go much further back then 2008 – yet, even this revelation hardly begins to tell the entire story of the Haym Salomon Statue. Actually, the statue was initially unveiled in Boyle Heights in 1944 with great ceremonial fanfare and media coverage. The new park monument also served as a focal point for a spirited war bond drive during World War II in what was then a significantly Jewish eastside enclave. Two mayors in three different decades issued proclamations in recognition of the statue's symbolic importance, including Fletcher Bowron in 1944 and 1951 and Sam Yorty in 1969. However, by the time of the 2008 rededication, it also earned the unique distinction, according to The City of Los Angeles Department of Recreation and Parks, of being the most removed, relocated, and rededicated park statue in the city’s history. To begin with, Los Angeles is not the first city to have a Haym Salomon statue. In December 1941, the city of Chicago dedicated the Herald Square Monument, which depicts the Revolutionary War figures of George Washington, Robert Morris, and Salomon standing side-by-side. 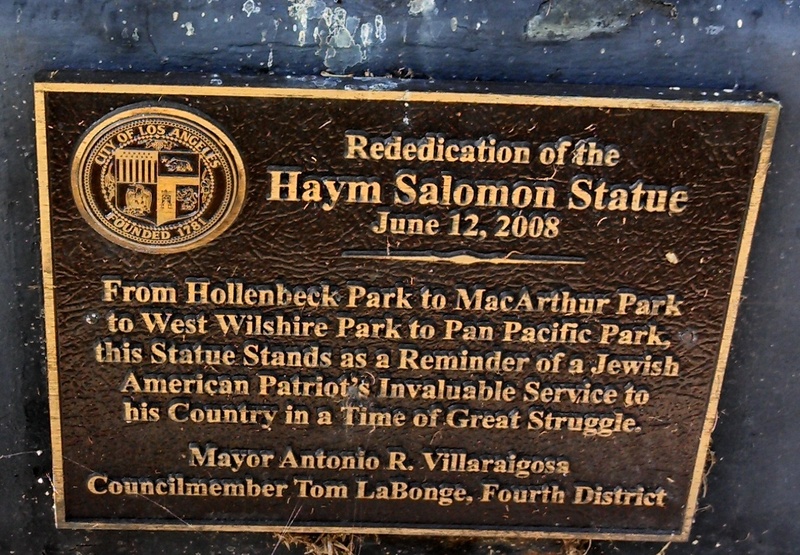 The idea for a Haym Salomon statue in Los Angeles began the following year. Artist Robert Paine petitioned the Los Angeles Parks Commission to approve a site for the monument he would create, claiming it would greatly assist the city's war bond-selling campaign. 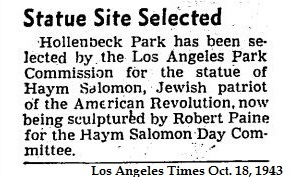 In February 1943, delegates from several posts of the Jewish War Veterans of the United States organization endorsed a plan to hold a Haym Salomon Day at Pershing Square, located in downtown, where the statue would be officially unveiled. 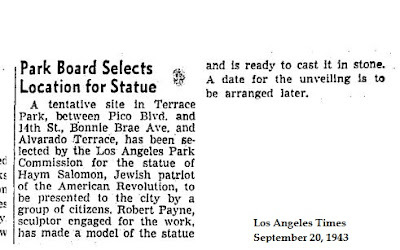 An article from the Los Angeles Times, 20 September 1943, noting that "a tentative site" for the Salomon statue had been found at Terrace Park. To solicit private donations for the project and extoll the historical significance of Salomon, several prominent citizens created the Haym Salomon Day Committee. Taking an active lead in the project, Beverly Hills physician and Jewish art authority, Dr. Monte Salvin, presided as chairman of the committee. But what were the significant contributions made by Salomon that earned him a public memorial? Haym Salomon had a life story that deeply resonated with many Jewish Americans. The subject of several popular books for adults and children, as well as academic studies, Salomon has been regarded as a figure that embodied both the ideals of a loyal American patriot, and a devoted Jew. 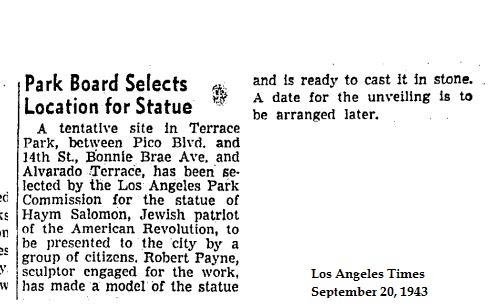 The 18 October 1943 edition of the Times noted a change in location for the Salomon statue from Terrace Park to Hollenbeck Park in Boyle Heights. Born in Poland in 1740, he settled in New York in 1775. Fluent in several languages, he worked as a trading goods broker, but was arrested by British forces as a suspected spy for the colonists. Eventually gaining his freedom, he fled to Philadelphia in 1778. There, Salomon established a successful brokerage business, had a family, and became a prominent citizen. Like many of the elite citizens of Philadelphia, he owned at least one slave, who ran away in November 1780. In 1781, Superintendent of Finance and signer to the Declaration of Independence, Robert Morris, enlisted Salomon to broker government notes to help finance the war for independence. Morris wrote in his diary that Salomon was highly respected for his ability to repeatedly obtain desperately-needed loans from foreign and domestic sources and he reportedly took little or no commission for his valuable services. Salomon apparently also extended personal interest-free loans to certain members of Congress, including James Madison. He was also an active member of Philadelphia's Mikveh Israel Synagogue, even leading a protest against a state law barring non-Christians from holding public office. The law was removed in 1790, but Salomon did not live to see this change take place. Salomon invested heavily in government securities and notes and experienced severe financial reverses when these rapidly depreciated after the war. This kind of insolvency, however, was not uncommon after the revolution. For example, Morris also went bankrupt and spent several years in debtor's jail. Salomon, who nearly was bankrupt after all he had done to advance the cause of the revolution, died on January 6, 1785. Highly regarded for his contributions to the fight for America's independence, Salomon was buried in the Mikveh Israel Cemetery. But his estate was unable to afford a headstone, leaving the exact location of his gravesite unknown to this day. 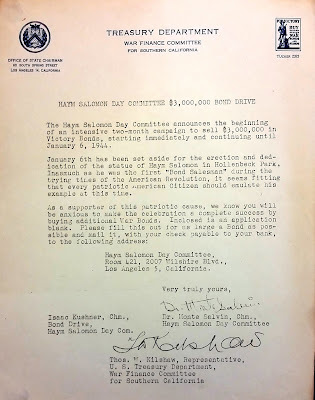 This November 1943 announcement for the "War Finance Committee for Southern California" from the federal Treasury Department outlined the tie-in between the unveiling of the Haym Salomon statue and an ambitious two-month drive to sell $3 million in war bonds. Courtesy of the Charles E. Young Research Library, University of California, Los Angeles. With Salomon's legacy as their motivation, the plans for the project put forth by the Haym Salomon Day Committee began to come together in September 1943 with the city offering Terrace Park in the Pico Union District as the venue rather than Pershing Square. However, on October 18, with the proposed statue already experiencing prospects for site relocation, The Los Angeles Times reported that Hollenbeck Park was the new official site. The Times also reported that the statue would be presented to the city as a tie-in to a United States War Bond selling program in support of the ongoing war. Check back soon for the continuing story of the Haym Salomon statue!